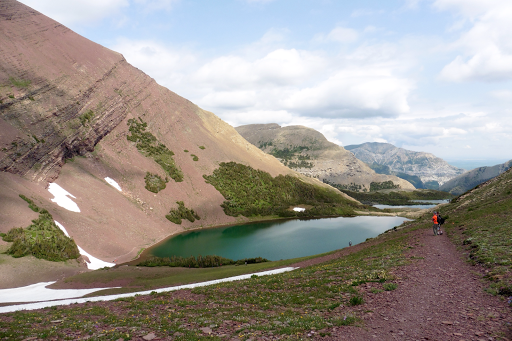 Oh man, what a way to kick off the Great Divide Trail! I have plenty of photos today! We know it won’t be amazing every step of the way, but today was pretty darn picturesque and almost like a dream at times. 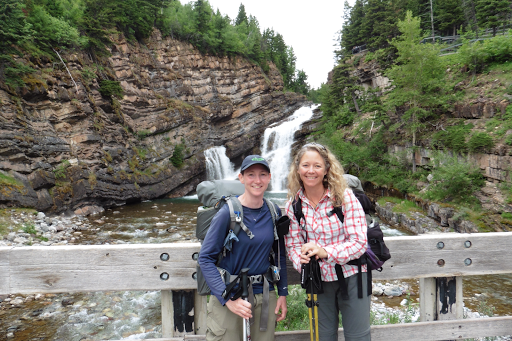 We started from Cameron Falls in Waterton at 10am and had 3202ft/976m to climb to our highpoint 7.6mi/12.2km into the day. Before we even left town, we had two animal sightings as we walked to the trailhead. 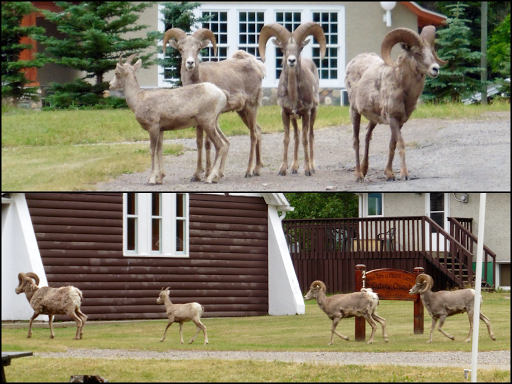 The first was a group of bighorn sheep just walking down the street! Really cool! I was able to get photos of them, but a minute later by the trailhead, a fox ran by with something it had caught to eat and I couldn’t snap a photo in time. 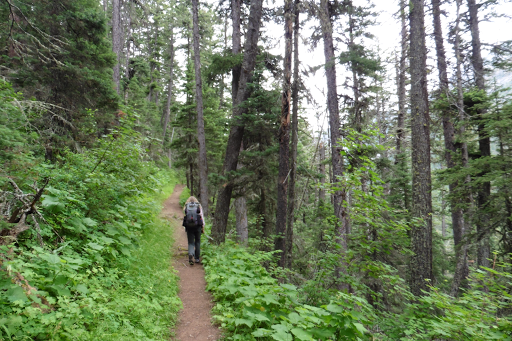 The trail we were on is a very popular trail called the Carthew-Alderson Trail. A very clear and defined trail. It was mostly forested the first couple of hours, but it was a wonderful forest that made me think of home in Portland. It was perfect hiking temps ~65F/18C. 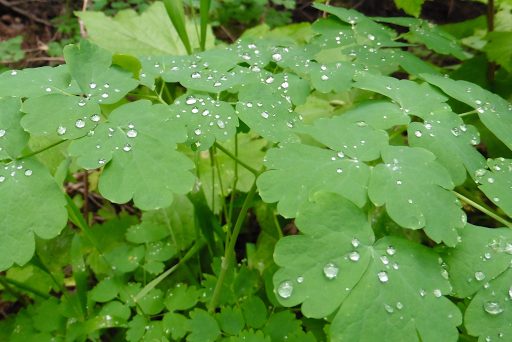 One of my favorite parts was the little beads of water still on the plants. The droplets looked like jewels. I was fully entertained in my happy wooded hiking state. Then we broke out of the woods into the stuff GDTers dream about. 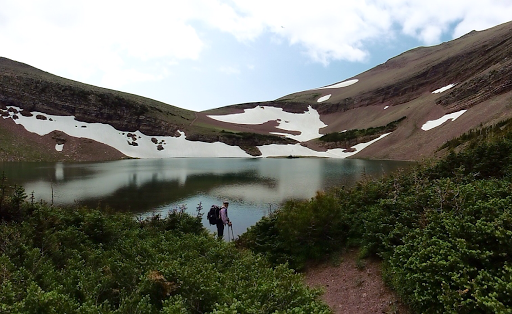 Our first alpine lake was a short side trip to see Alderson Lake. Like most of the sights today, the pictures can’t do it enough justice. It was in a bowl with cliff walls rising up around it. 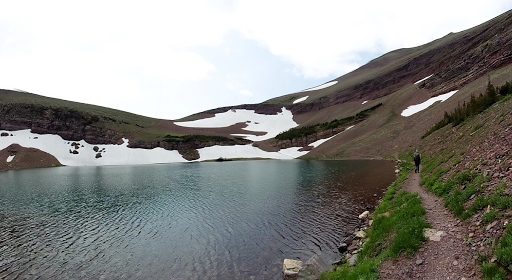 As we hiked up above the lake, we could look back and see the water was much bluer. This is where I realized what I left behind in town this time…my sunglasses! They are up in the visor of the car as I was using them to drive. Now I need to get new ones in the next town, ugh! At least it wasn’t bad with out them today. We took a break up a bit higher as we saw Mt Carthew. Our path skirts the left side of the mountain to a pass called Carthew Summit (not the actual summit). Notice the waterfall coming down the center and wildflowers. A perfect break spot and hardly any bugs! 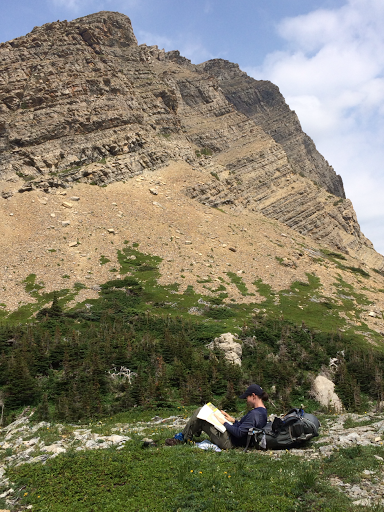 We have been using the Gem Trek Waterton Lakes map for this section and it is wonderfully informative. Really fun to look at what’s all around us. Gem Trek maps are one of many sets of maps we have and we will use them when we go through the national parks. I believe the GDTA site lists which ones to get for the GDT. I wish these maps covered the whole trail! From there, we came to the Carthew Lakes. 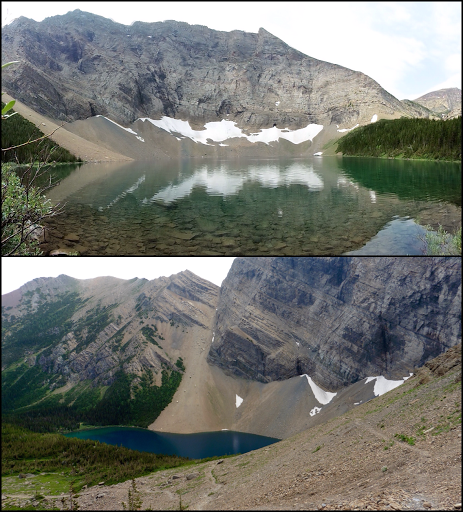 Three lakes that the trail skirts along. Pretty much perfect scenery. 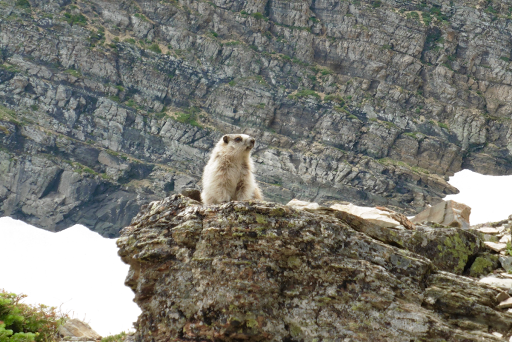 Even saw a marmot. This hike is really popular and at this point, we had many groups hiking towards us because there is a way to get a shuttle and do this hike southbound mostly downhill. We got many comments of surprise that we were walking up all this, ha! 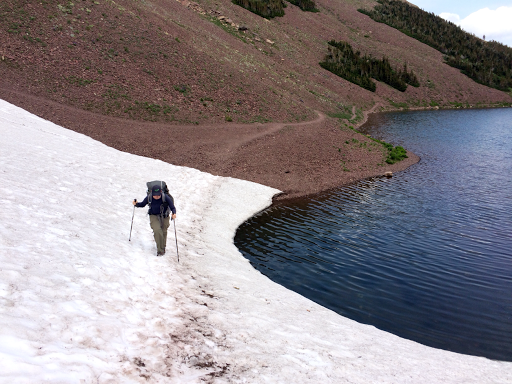 There was some snow patches and one of the day hikers even slid on a traverse down a short bit into a lake. It was shallow and not a far fall, but that doesn’t make it any warmer. Here’s the view walking along the lakes and then looking back at them as we headed to Carthew Summit. Just when we thought it couldn’t get any better, we hit the pass called Carthew Summit and got slapped with a full panoramic view of awesomeness. We aren’t sure of the name of the range…maybe the Clark Range? This is the view we had for lunch. It’s hard to see here, but the lakes (we could see three) were a beautiful blue and the shadows of the clouds made for constantly changing lighting. We also both enjoy how the mountain tops aren’t uniform and have usual jagged forms. After lunch, it was a cruise down to Cameron Lake and then a brief road walk to connect to Akimina Pass. 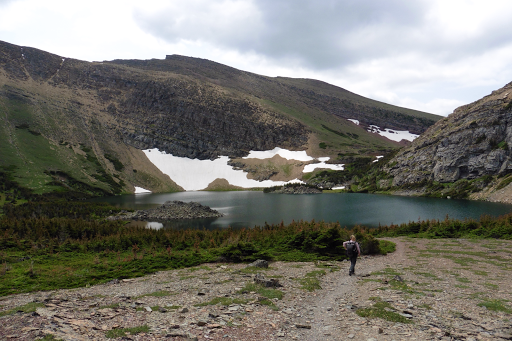 From here, it was a short side hike off the GDT of 1.5mi/2.5km to Akimina Campground. 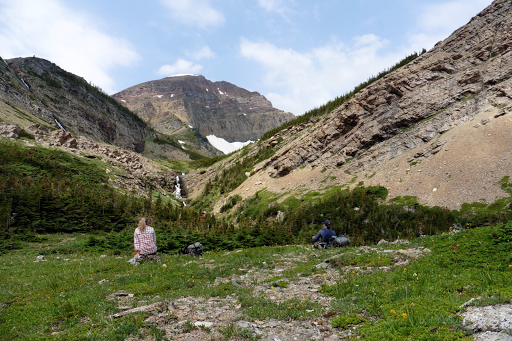 This was our stopping point because it is outside of Waterton National Park and we didn’t have to get a permit to camp. It was $5 each, but no reservation needed. We are happy to have it to ourselves. Habituated deer have been roaming around since we arrived. 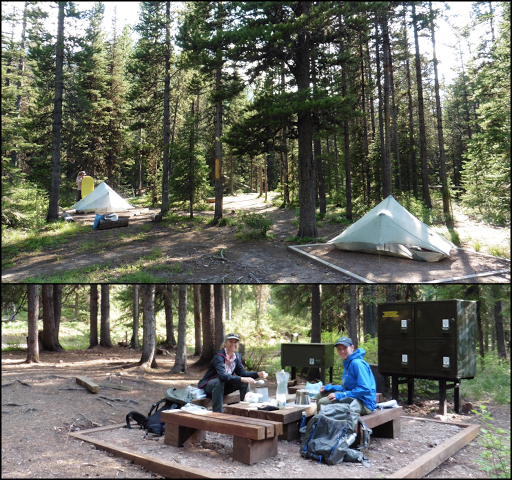 It’s a nice wooded spot with tent pads, bear boxes, a privy, and an eating area. We were at camp by 5:30pm and love the relaxed evening! It is now 10pm and still light out. I’m going to have to get used to all this light. Tomorrow there is an option of an alternate, but the official GDT is also great, so we aren’t quite sure which one we’re going to choose. Oh poor us, stuck between two epic scenery choices. Really happy tonight and feeling at home on this trail.